Midget: Biff Wilcox is looking for you, Rusty James. He's gonna kill you, Rusty James. Q: Why is this film in black and white? I realize that's not saying it's the best ever made, but it certainly marked me so much as to regard it as my all-time fave. The movie reminisces of Elia Kazan's Dean movies, and "The Wild One" starring Marlon Brando. 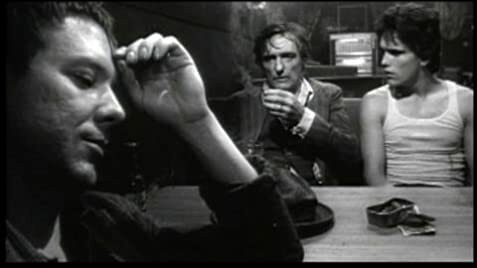 Just as those movies (and much better done, IMHO), Rumble Fish is about violence as a consequence of uncomprehension; loneliness; and family relations in a sordid, black and white environment. Not even this choice is random, as its B&W filming (and somewhat deficient sound quality) is yet another commentary on life as seen through the eyes of its characters - and author. Every scene in this movie brings a realization, though some of the dialogues are indeed a bit naive when seen after its time. 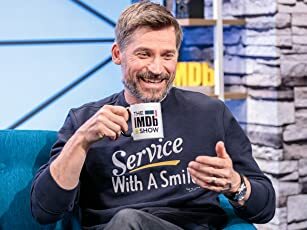 And here I could engage in a debate on "naiveté" vs. "savvy", and whether an innocent view of life really means less message depth (or whether a jaded outlook really guarantees understanding), but I digress. The point is, I'm a 27-year old man and I still cry every time I see this movie. 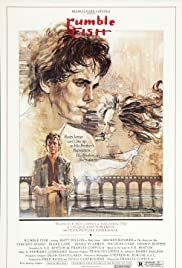 The first time I saw Rumble Fish, I thought I identified with the Motorcycle boy and his alienation from the world he was put in. After a few more times, I realized more and more that I "was" Rusty-James - That, to an extent, EVERY man is a little Rusty-James; trying to live up to a hero image, and helplessly watching as your ideal slips past your reach and lets himself be killed, without you ever understanding anything until it's too late... or is it? Where Mel Gibson and Bruce Willis speak to the hero we WANT to be, Matt Dillon speaks to the MEN who want to be that hero, and leads the way out. The astounding soundtrack, exquisite photography and perfect takes don't hurt any, either. Buy it, rent it, whatever. See the goddamn movie. It is worth a try (and a much, much better score than 6.7). 72 of 83 people found this review helpful. Was this review helpful to you?